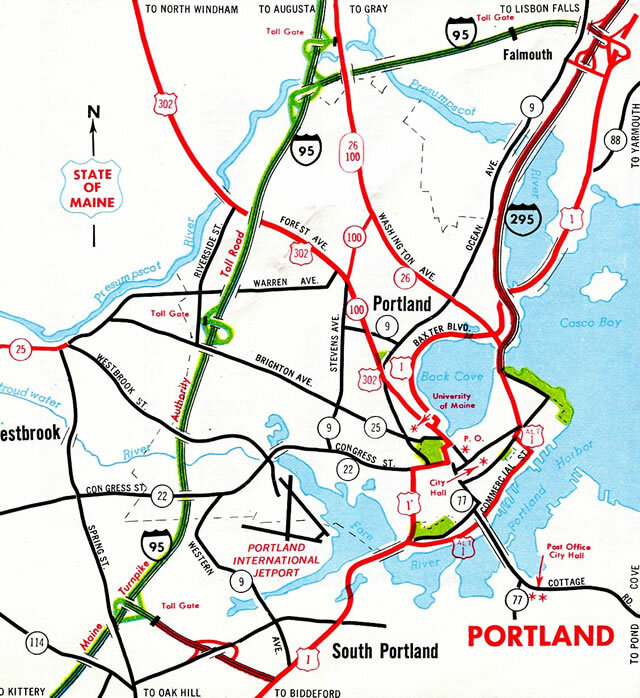 Interstate 295 constitutes both an urban loop east from the Maine Turnpike through South Portland and Portland, and a through route connecting I-95 with Brunswick and U.S. 1 leading east to Down East Maine. 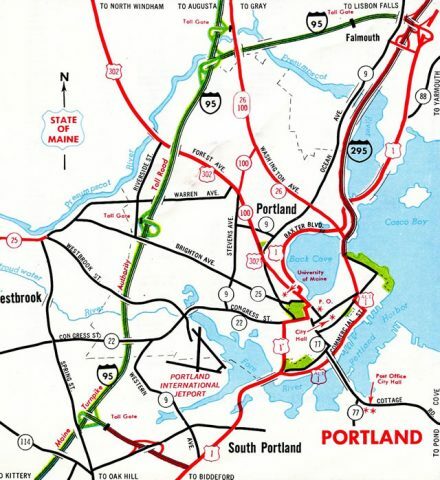 Prior to January 5, 2004, I-295 consisted of just a 10.90 mile route through Portland, ending at the Maine Turnpike Falmouth Spur, which carried Interstate 95 east to its toll free section leading north to Gardiner. The state of Maine initiated a statewide renumbering of Interstates 95, 295 and 495 in an effort to reduce motorist confusion. The December 31, 2017 FHWA Interstate Route Log and Finders List still references the pre-2004 mileage of 10.90. 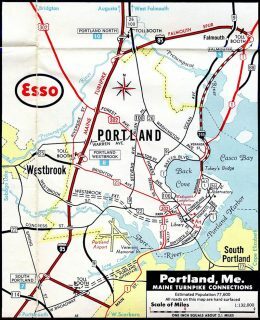 Initial construction for Interstate 295 provided a bypass for U.S. 1 north from Tukey&apos;s Bridge along the west side of Presumpscot River. 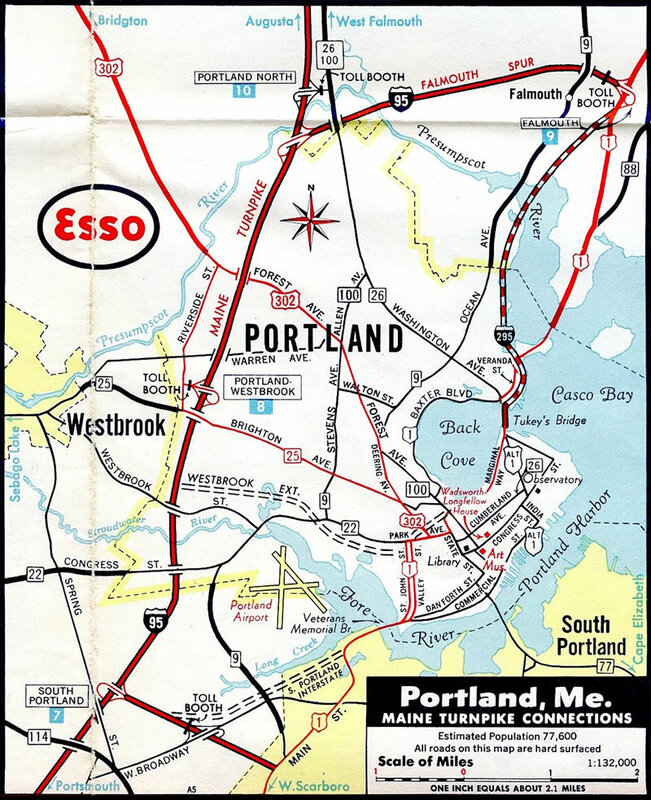 Interstate 295 completed north from Tukey’s Bridge across Back Cove to Interstate 95 (Falmouth Spur) – 1970 Maine Official Highway Map. The proposal to redesignated I-495 along the Maine Turnpike as Interstate 95, renumber the Falmouth Spur to unsigned I-495, and extend Interstate 295 north over former I-95 to Gardiner was approved by AASHTO on October 11, 2002. Interstate 295 north defaults onto I-95 (Maine Turnpike) beyond the diamond interchange with Route 9 & 126 (Lewiston Road). Photo taken by Sheila Schumacher (05/13/04). Interstate 95 follows the Maine Turnpike south from U.S. 202 & Maine 11-17-100 (Exit 109) in Augusta. The toll road begins ahead of the split with Interstate 295 (Exit 103) near Gardiner. Photo taken 06/28/05. Interstate 295 south provides local access to Maine 9 & 126 (Lewiston Road) south at West Gardiner. An off-ramp previously linked the Maine Turnpike with the state routes directly as part of a full trumpet interchange (old Exit 14) just beyond the partition with I-295 at Exit 103. Photo taken 06/28/05. Passing below High Street, Interstate 95 progresses south one half mile to the split with I-295 (Exit 103). I-295 follows the pre-2004 route of I-95 south to reach Freeport in 37 miles. The Maine Turnpike shifts southwest 23 miles to Lewiston and 28 miles to Auburn. Photo taken 06/28/05. Entering the wye interchange (Exit 103) with Interstate 295 south on I-95 (Maine Turnpike) south. The two converge at South Portland, 58.3 miles on the Maine Turnpike and 53.0 miles via I-295. Photo taken 06/28/05. Forthcoming Maine 9 & 126 (Lewiston Road) connects Interstate 95 north with I-295 south in place of a former ramp at old Exit 14. Photo taken 06/27/05. Maine 9 & 126 cross paths with Interstate 295 just east of the roundabout with the Maine Turnpike access road from Exit 102. The paired routes venture 3.2 miles east to U.S. 201 (Brunswick Avenue) in Downtown Gardner. Photo taken 06/27/05. Two ramps were retained from the original trumpet interchange (Exit 14) at West Gardiner. Remaining movements between I-95 and I-295 are handled at the SR 9/126 exchange with the Maine Turnpike. Photo taken 06/27/05. Interstate 295 ended at the Falmouth Spur (unsigned I-495), a four-mile connector west to the Maine Turnpike (I-95) mainline, until 2004. An end sign for I-295 stood at the exchange with then I-95 prior to the 2004 renumbering. I-295 overtook I-95 north from here 41 miles to Gardiner. Photo taken by Jeff Royston (12/02). Traffic on the Falmouth Spur east partitioned beyond the Maine 9 (Middle Road) overpass into single lane ramps for the continuation of I-95 north to Brunswick, U.S. 1 south back into Portland, and U.S. 1 (Blue Star Memorial Highway) north into Yarmouth. Photo taken by Gary S. Peterson (02/14/02). Interstate 95 made a TOTSO (turn off to stay on) connection to continue north from the Falmouth Spur onto the toll free route to Brunswick. Photo taken by Gary S. Peterson (02/14/02). An end shield for I-295 south precedes the Maine Turnpike toll plaza beyond Exit 1 with the Interstate 95 Connector. Traffic defaults onto I-95 southbound ahead of the interchange with Haigais Parkway and Payne Road. Photo taken by Sheila Schumacher (08/31/04). Interstate 95 lowers to cross the Nonesuch River on the one mile approach to Exit 44 with Interstate 295 north. Photo taken 06/27/05. Back to back off-ramps depart over the ensuing one mile of Interstate 95 north for I-295 north and Route 703, a two mile freeway connector east to U.S. 1 & Route 9 (Main Street). Route 703 joins the Maine Turnpike with a retail area anchored by The Maine Mall, I-295 north and the Scarborough Connector (Route 701). Photo taken 06/27/05. Interstate 95 crosses underneath Maine 114 (Gorham Road) at the partition with Interstate 295. Downtown Portland is five and a half miles to the northeast. Maine&apos;s largest boasted an estimated population of 66,937 in 2016. Photo taken 06/27/05. With no direct access to I-295 north from I-95 south at their wye interchange, Route 703 provides a link to Interstate 295 north at South Portland from forthcoming Exit 45. Photo taken 06/28/05. Southbound at the trumpet interchange (Exit 45) with Route 703 east. Route 703 comprises a two mile freeway spur from the Maine Turnpike southeast with interchanges at adjacent Maine Mall Road, Broadway and the Scarborough Connector (Route 701). Photo taken 06/28/05. "DOT to start repairing I-295 in Portland area – Most commuters won’t be slowed down by the work, an official says." Portland Press Herald (ME), June 15, 2010.